but now it’s really hard to pick just one. For myself, I prefer just Off White paper as you can do so much with it. Then when it comes to “Printed or Designer” paper it’s far to hard to pick, as my mood changes so much. So today I’m going with this wonderful Blue designer paper form K & Company. I did distress this some and colored and stamped on it. My stamps are from TAC, Cornish Heritage Farms, and Stampin’ Up. The paper works so beautifully with those stamps and love the distressed edges. 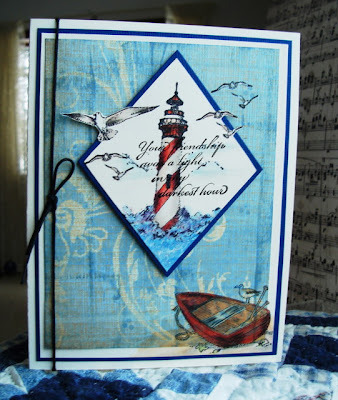 A wonderful card with all the stamping, the colours are just perfect for the theme. This is really a wonderful card, love the images you chose. I'm with you, how can you possibly just pick one? Beautiful card Vada, I can almost taste the salty air! This is so pretty- love the images- and I love your papers- I will have to give this challenge a go...! Really great colours - love red and blue together.